Originally Posted on August 29th, 2012. Last updated on August 30th, 2015. Breakfast. As I get older, I tend to realize small things that make my life great. Things like not using an alarm clock (I have a dog for that), withdrawing from pop culture (I had to look up what YOLO meant and the first time I head Call Me, Maybe was actually the Cookie Monster version), and I’ve stopped letting politics upset me (personally I think Jed Bartlet should be president and for those of you who have no idea what I’m talking about, I don’t own cable and am currently watching The West Wing for the first time). However, one of the things I cherish most is the ability to sit down, drink coffee, and eat breakfast every morning. Rarely do I have a morning when I’m running out the door, feeling stressed and in a hurry (luckily my classes start late enough that time is not something I lack). When I worked at the bakery my wake-up time was 3:00 to get out the door by 3:30 and start work by 3:50. My breakfast would often be a scone or danish that we made that morning while I was whipping up pies, cookies, and cheesecakes. I didn’t realize until then how much I valued my slow-going, coffee filled mornings. I realized that mornings and breakfast were my time to gear up for the day and without it, I’d often feel lost. Plus, I do love a good, savory breakfast. 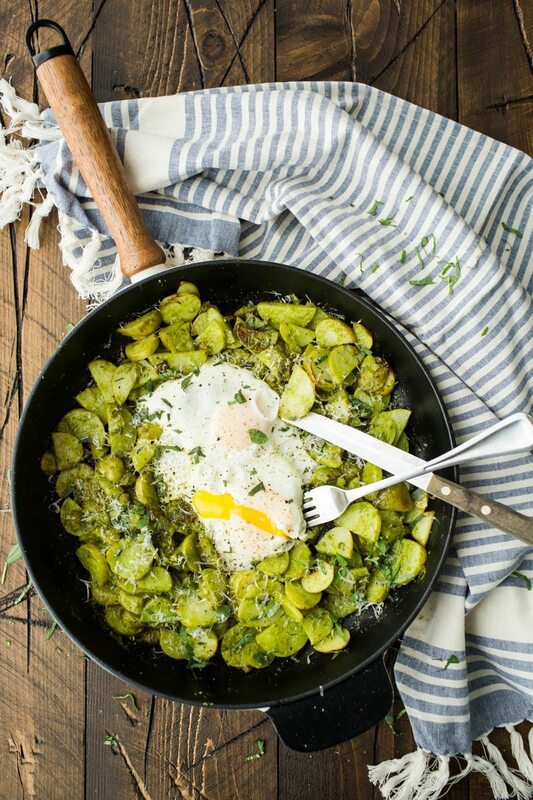 This potato skillet is perfect for those mornings and if you are one of those people who has to run out the door in the morning, tuck it aside for a leisurely weekend. Make the pesto ahead of time for one less step you would need to do in the morning (and a few extra minutes of sleep). My pestos vary depending on the machine I’m using to make them. My food processor and regular blender make a pesto where the sauce retains some texture from the basil. However, using a high-powered blender (like my Blendtec), creates a green sauce (pictured here). I actually prefer to leave some basil intact, but I wanted to give a heads-up just incase your skillet doesn’t look like mine. Whenever I make one of these skillets, it usually means it’s a one-skillet meal with no sides. You could easily pair this with some fresh fruit for breakfast or a simple salad for lunch. However, there are a few variations you could use to mix up this potato skillet. Sweet Potatoes: Pretty much any time I use regular potatoes, I can easily swap in sweet potatoes. Just make sure you keep the cut of the sweet potato to 1/4″ to help with the quick cooking time. Spicy Pesto: I love adding a bit of chili paste to my pesto to create a kicked-up dish (like this pesto noodle bowl). If you like a little spice- this variation is for you. Alternative Pesto: Spinach, arugula, or even a mix of herbs like cilantro, parsley, and basil make for a fun pesto mix. Saveur has 11 pesto varieties that you could easily use in this skillet. Potato Salad: This variation is a bit of a stretch but instead of doing the potato skillet, try roasting the potatoes and onions, then tossing them with pesto and hardboiled eggs. This dish is easily portable and makes for a fun potato salad (either for picnics or lunch). In an 8″ or 10″ skillet with a lid, heat olive oil over medium heat. Add in onion and cook until softened, 3-4 minutes. Stir in sliced potatoes, reduce heat to medium low, and cook until browning, 6 to 8 minutes. Add in 1-4 -1/3 cup pesto, stirring until potatoes are covered. + Parm Cheese: As always, check your cheese. If you can’t find veg friendly parm, leave it out or use a sub. 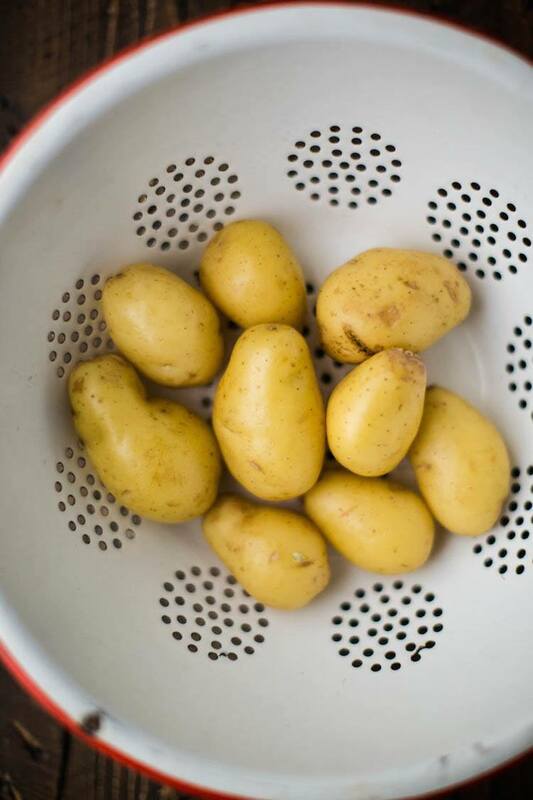 + Potatoes: I love fingerling potatoes but sometimes they aren’t available or are a bit more expensive. I’ll occasionally use yukon gold potatoes, cut into similar half-moon sizes. I cheat a bit when I make pesto, and use what I have on hand. Usually it’s baby spinach instead of basil, and walnuts instead of pine nuts. I’m sure they’d be really tasty combined with your potatoes! Also, I’ve never used lemon juice in pesto before, so I’m looking forward to that. Great post! Amen on politics and on leisurely breakfasts. This looks wonderful! Erin, I’m right there with you on the withdrawal from pop culture. The first time I heard “Call Me, Maybe” was a version played on classroom instruments that was sent to me by a friend – since I taught elementary music. Wow! This looks SO amazing! Definitely plan to make it this weekend!! A morning breakfast with scone and dish sounds good too but I have a savory tooth and the skillet of pesto potato would make me more happy! Just look at those beautiful teeny tiny potatoes! This combination sounds perfect. I bet you could make a whole casserole of those potatoes with eggs baked on top for the most amazing brunch party ever! This is one yummy breakfast! I just recently made a potato salad with pesto and gosh darn it…. why did I wait so long to do that?? I devoured it in a day or two, selfishly hiding it from my family. I can be mean like that. But warmed, skilletized and with a meltingly delicious egg? That’s perfection, right there. And obviously, it’s up next. I couldn’t agree more! I’m getting so much better at not letting stuff bother me – it saves the mind. Also, looove this skillet! Looks unreal! this looks delicious! i’ve been looking for more cast iron skillet recipes, so this came at a perfect time. I loooove potatoes! This looks so good! I made this tonight for dinner, adding orange peppers and using goat cheese instead of Parmesan. It was amazing, and I’m looking forward to it becoming a staple of my ski- morning breakfasts this winter! This is the first time seeing your blog and it’s absolutely incredible! All of your photos are beautiful and the recipes are easy to throw together on those busy days. Also Jed Bartlet will always be my favorite politician, and West Wing my favorite TV show. Love this idea! I always have eggs and potatoes in the house as well as pesto, (I make a lot in the summer time when the basil is in season and then I freeze them in tiny glass jars.) I think I will make this for lunch tomorrow. YUM! 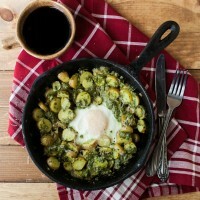 I have recently had an urge for skillet breakfasts. I prefer red potatoes (new potatoes), particularly small ones. Good job cooking the eggs with runny yolks! What’s better than starting your day with beautiful looking breakfast like this one? Lovely simple flavours and lovely bursting colours – this is how you enjoy a leisurely breakfast! Pesto on a potato, such a simple thing, but I never thought of doing that. It sounds like a perfect combination. I have to try this out, but I will probably reserve it for my evening meal. This is such a great breakfast! Easy and quick to do! My bf is the worst in the kitchen and I try to give him the simplest of recipes to feed him when im abroad. 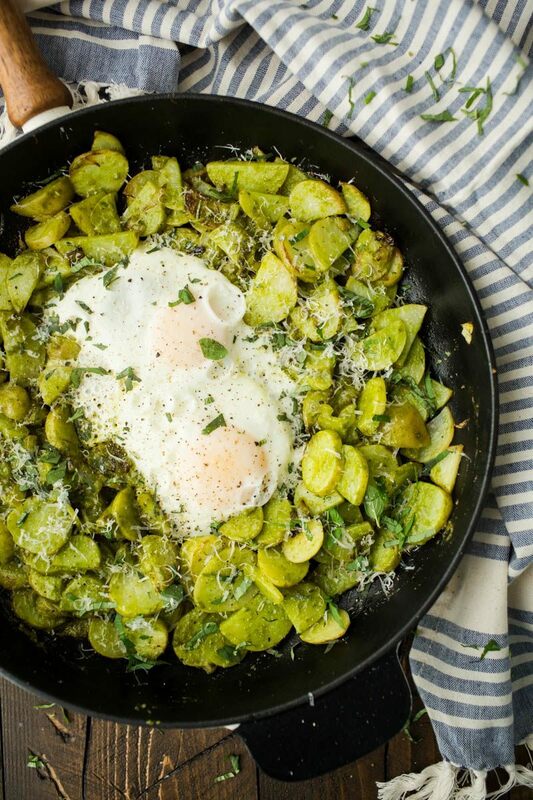 This recipe was great for him, he just bought store made pesto and all he had to do was cook the potatoes and egg! Thank you for making life easier for my man with this delicious meal! 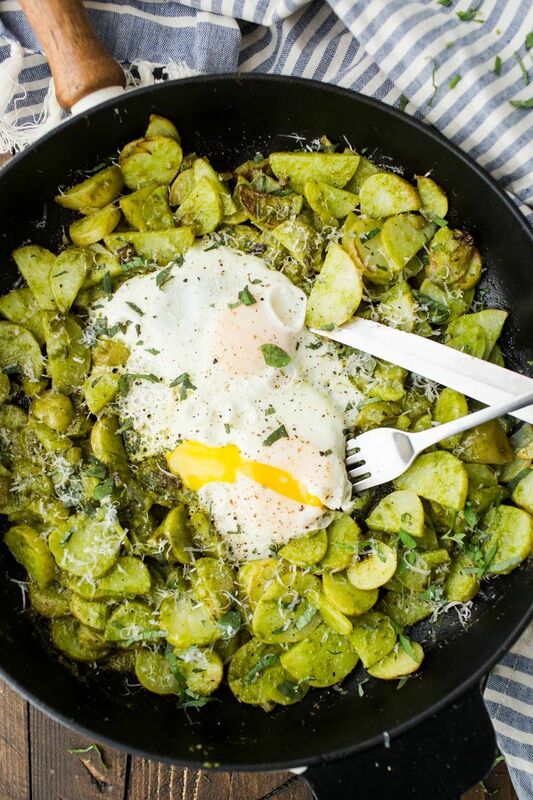 What a great idea, pesto on potatoes. I am going to try this today! Thank you for the great idea! Two questions…does the pesto need to be thinned before adding to the potatoes? Mine tends to be fairly thick. Also…I don’t like runny egg yolks, so should I just let the egg cook longer? Hi Charlene, yes, I would thin it slightly (but you don’t need to a lot) and yes- if you cook for just a bit longer, you end up with eggs that are an over-hard texture! That looks really nice and tempting! I’ve always loved pesto sauce. I have been making pesto sauce all these years, but never tried this combination with potatoes and benedict eggs. Interesting. yesterday I prepare this recipe and I loved it. Made this for my husband and I to share, who loves pesto with anything, when I was back from uni. As I’m not a huge fan of eggs I bought a vegetarian haggis and served that with the pesto potatoes. My husband got the eggs. We enjoyed the combination!